food be delicious. The Root helps keep me in delicious healthy food and beverage. 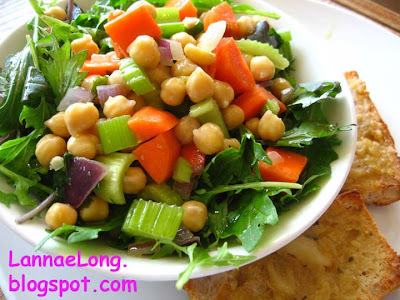 This last trip I took, I dropped by the Root right after I landed, and I has this really delicious salad with chickpeas, greens, local veggies, and a lemon and olive oil dressing. Accompanying the salad were two slices of homemade toast. The older I get, the worse I feel after eating fast food and highly processed foods. Nothing is highly processed at The Root. I felt great eating the dish and I felt great driving off to my destination afterwards. I am so glad The Root is convenient for me, and I really like this place. This is an update to may last trip to Cleveland, I flew in and stopped by The Root again for a nourishing lunch. This time I got the spinach salad with brown rice, a farm egg, and a small whole grain muffin. It was filling enough, but did not weigh me down, so I could go and do the things I had to do. Again, I felt like I did my body good. Thanks Root! Also, one bonus thing, I pulled into a parking spot behind a gal who was just leaving, and she left over an hour on the meter, so I got to park for free! Bonus! Buford Highway north and east of Atlanta is the most delicious road in the Atlanta Area. There are restaurants and grocery stores of all ethnicities on this road, with roots from Europe, Asia, Africa, and Central and South Americas. There is even the ubiquitous American fast food. Where to go and what to eat on Buford Hwy? Well, I did not have a GPS at the time, I have a dumb phone (opposed to a smart phone, but my phone isn't really dumb, it just is an old fashioned cell phone) and I did not have any access to browsing the internet for good suggestions to eat on Buford Hwy. So, I did my old analog method and drove down Buford Hwy and looked to see what I could see. I started in Duluth and drove the 20 miles of Buford Hwy down towards Atlanta. I started about 7:45 pm in Duluth, and I wanted Chinese, Cantonese really, food. I looked at many restaurants to see how many cars were out front, and if people were going in and out of the restaurant. There was one restaurant that had a lot of cars out front, there were people going into the restaurant, and people coming out with to-go boxes of food. While other restaurants were winding down at about 8:45 pm, Bobo Garden was hopping with diners. The restaurant used to be a Korean BBQ restaurant with each table with a grill station embedded into each table, and exhaust hoods over the grills. I don't think that this Chinese restaurant uses the BBQ grill portion of the tables anymore, but they did buy the restaurant as it with the tables and they use the tables as tables. 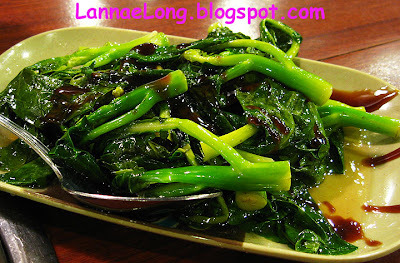 The menu is definitely Cantonese style foods. There are squid, seafood, fresh seafood from the tanks of fresh seafood along the back wall, there are clay pot dishes, there are hot pot dishes, there are congee rice soup dishes, and more. The menu has tripe and duck tongue dishes, which I would not choose, but I know that many of my older relatives really enjoy Cantonese style slow cooked clay pot tripe. 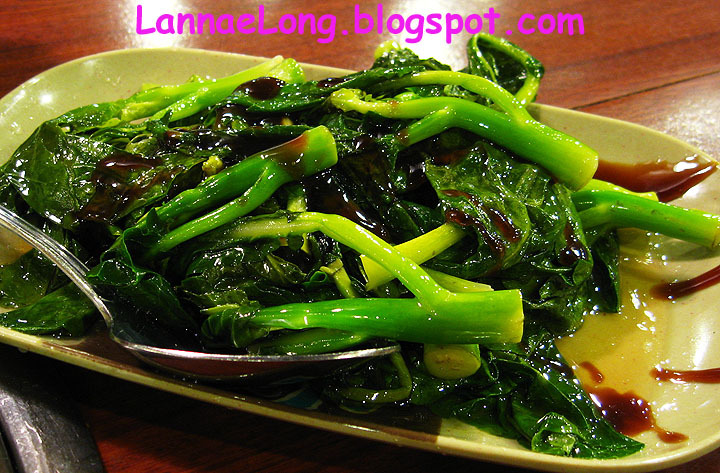 There are some seemingly Americanized dishes including vegetables and stir fried foods, but those too seemed are rooted in Cantonese cuisine, not American fast food. The waitstaff mostly speaks in Chinese, and there was only one waiter who spoke some English, and he was the one who was told to wait on me, as I speak very little to no Chinese. What I am trying to say is, that Bobo Garden I believe is the real deal Cantonese style restaurant, and you are not going to get any Americanized meal here. Unfortunately, it was only me dining, so I only ordered 2 dishes, one Chinese broccoli and a salted preserved duck egg and pork dish. I should have gotten a clay pot dish too, but I how much can one eat? The waiter did steer me to the pork dish, but I think he did it because it was the most mild and most recognizable dish to someone who doesn't know real Cantonese food. The pork dish was a good dish, but a little ordinary, so next time, I will likely try a clay pot dish like slow cooked Chinese preserved meats with taro root and garlic, Cantonese duck, or a seafood dish made with seafood from one of the seafood tanks. There are some tasty looking dishes now that I found the Bobo Facebook page that you could not possibly get in an Americanized Chinese restaurant, rather only in a real Cantonese style restaurant. On Yelp and Urbanspoon, Bobo Garden has good reviews, and everyone says this is an authentic Cantonese style restaurant. Even one person who lives in a Chinese food void (small town Alabama) orders food from here and takes it home on ice to freeze and eat later. Brilliant. Next time, I am bringing a cooler, blue ice, baggies and plastic containers. Doraville, GA, I can't wait to see you again! I can't wait for the deliciousness of Bobo Garden! The Brass Pelican has moved into the old Old Plat on the River restaurant location along the Huron Boat Basin access channel from Lake Erie. From my perspective, the Old Plat closed about a decade ago, and maybe reopened briefly here an there, but never open when I passed by it over the decade. This location has a good sized indoor restaurant and bar area, and a very large outdoor patio with a view of the channel from Lake Erie. For at least a decade, the outdoor patio was chain linked fenced to keep vandals out. The fence was an eye sore and and it was frustrating to walk along the channel from the boat basin to the Huron lighthouse because the ugly chain link fence was in the way. Now with the Brass Pelican open the horrible chain link fence is gone, and there walkway is completely open now. Now, boats can come right up the channel and dock next to the Brass Pelican. If driving, there is a huge free parking lot right outside. If walking, there are plenty of sidewalks and the channel walkway now open. The patio is really nice to sit for a drinks and bar foods over looking the channel to the boat basin. The only problem with the view is what is across the channel, it is a ConAgra industrial area with a huge limestone processing factory, industrial smoke stacks, big piles of rock, huge industrial setting basins that attract seagulls (and seagull poop), and a huge industrial building. The 1st time I saw this area over a dozen years ago, I thought that the town was cute, but the ConAgra factory buildings and industrial piles was just terrible to look at. When I first came about Huron Boat Basin about a dozen years ago, I saw the cuteness of the town, but when I caught a glimpse of the ConAgra industrial area breaking apart the boat basin horizon, I was actually a bit grossed out. 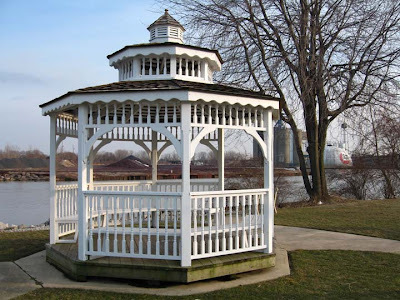 This is not the only industrial area imbedded into a vacation shoreline community along Ohio's Northshore Funcoast, there is one on the west side of Sandusky, and there is another as you drive into Marblehead. Huron, Sandusky and Marblehead could be quaint vacation areas, but it is tough to get around these huge industrial smoke stacks and buildings. This area could be as valuable as Laguna Beach, central Cape Cod, Lahaina, Chautaqua, etc, but the old industrial areas are just too imposing. The Brass Pelican has some visual issues to deal with, but besides ConAgra industrial area issue, this Brass Pelican patio is really nice. When we were there, there was only one waitress for all the tables and seating outside (maybe 20 tables worth of seating) and there was no bus-service to remove the dirty dishes and glasses and clean the tables for new patrons to come in. There weren't that many clients at the patio because all tables were covered with dirty dishes, so there was no where to sit. The table we sat at was not clean, but I am guessing some visitor moved the dirty dishes to the next door table, just to clear a place to sit down. There were at least 3 parties of 4 who came by looking for a place to sit, but did not because the place was so terribly covered in dirty dishes, that they moved on down the channel to eat and drink somewhere else. We went in late July, and the place has been open for months. That should have been enough time for the Brass Pelican management to figure out work flow, and at least get a bus-person out there, and not leave everything to only one waitress who was obviously overwhelmed. We got some bar snacks, drinks and a salad. The bar snacks, house made chips, wings and perogies were very good. There are a ton of different flavors including the original Buffalo, teriyaki, garlic, parmesan, butter, bbq, etc. 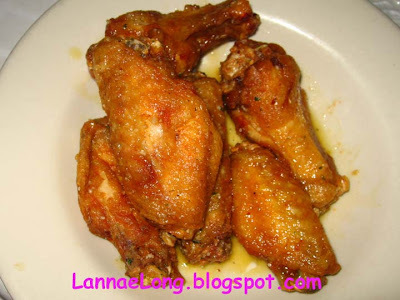 That wings are worth visiting the Brass Pelican. The perogies also were good, and served in a classic way with sauteed onions and sour cream. 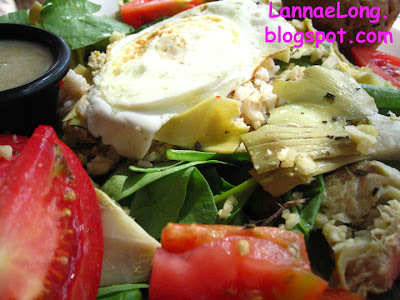 The salad was scary and sad with wilted lettuce and a dirty bowl. The chips were not crispy enough, rather they were soggy. Getting drinks was tough because the waitress barely came around and we were awfully thirsty. At a bar with food, it is important to keep people hydrated with water because they are bound to stay longer and order more. When our little water glasses ran out, and our salty bar snack foods too hold, we either wanted more drinks and water, or to leave. The 1st chance we got, we left because we just needed water. May Garden 2011, What is this? Anyone out there, what is this pepper? It is slightly larger than a quarter, and it grows upwards instead of downwards. It is orange when ripe. What is it? 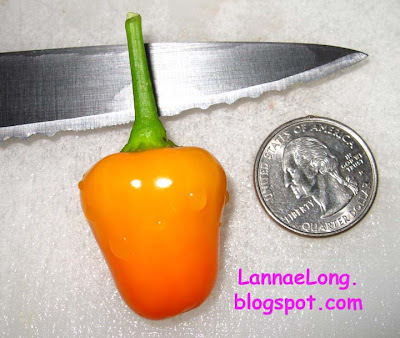 Here it is, a small orange pepper. I cut it open, scraped out most of the seed and ate it. I was afraid it was going to be hot. There is a little heat, but not so bad to make me sweat. I saved pepper seed from last year. I saved a yellow banana type pepper, a little green sweet pepper, a jalapeno peppers, small cherry bomb hot peppers, and cayenne peppers. I did not have orange peppers last year. All my peppers last year grew downward, or hanging downward from the plant. 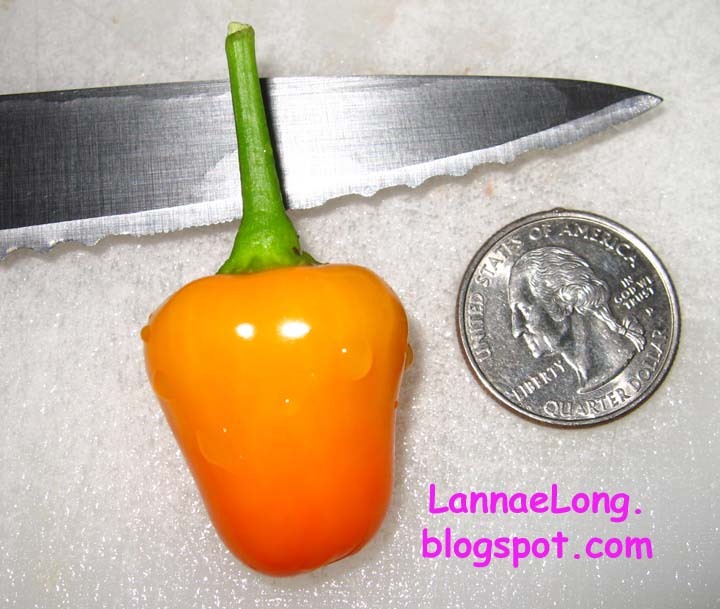 So, here it is, a smallish orange pepper growing upward. 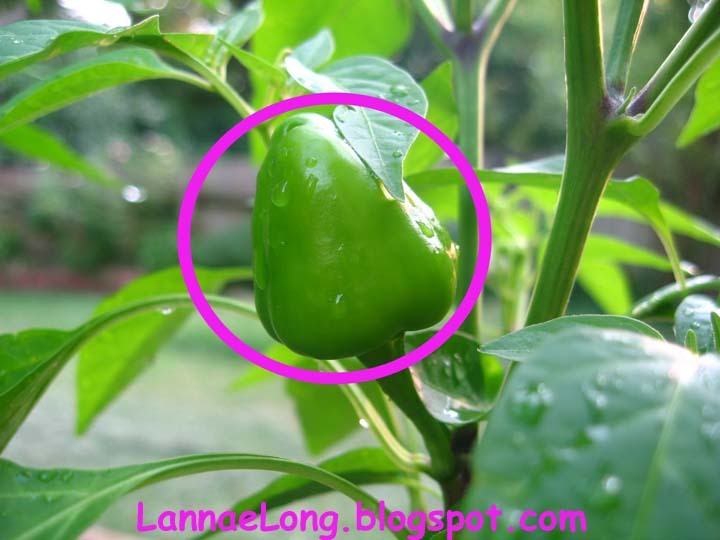 Did I have some pollen crossover and make a new pepper? Well, it is tasty, with a little spicy heat, but not too overwhelming. Very good. As my food blogger friend Lesley Eats says, there are no wild cows left in the world, the wild cow is extinct. Every time I pass by or see the Wild Cow restaurant, I think of Lesley, and her statement of wild cow extinction due hundreds of years of domestication and making the cow a beast of burden. It has been a tough couple of years for eating right for me. I was required to go to remote places in the USA where the restaurants available are only fast food, deep fried foods, and places with the lack of fiber and veggies. I went on biz trips with co-workers who just wanted to dine and drink at the near by watering hole, and there have been plenty of meals of deep fried foods and a pint glass. Every time I return home to Nashville, I have a deep desire to "detox" and all I want are nice glasses of filtered water from my tap, fresh veggies, raw foods, sushi, local organic dishes and DEFINITELY nothing deep fried. A couple weeks ago, after a week of being in a remote place with co-workers, as well as I, we were too exhausted to figure out anything for dinner besides the bar next to the hotel and just downing deep fried foods, the only food on the bar menu. I came home needing to "detox" from this unhealthy, heart and artery clogging, stroke making, diabetes contributing food. The day I returned, I was supposed to meet my buddies for dinner, and these buddies could swing either way, super healthy or fried bar food, and thank goodness this time we were all on the same page, we all have junked out for weeks, and we all wanted to eat healthier. So, off to the Wild Cow we went. After my week of h#llish deep fried in trans fat bar food, I got giddy looking at the Wild Cow menu. Very few items are deep fried. There are whole grains and brown rice. There are raw veggies, fresh organic veggies, and well placed seeds. The menu has vegan and vegetarian options, as well has hand crafted sodas. Oh, what to get, what to get!? So, as we looked at the menu, none of us have been here before because of what we heard before. It is inconsistent to an extreme, it was either an A+ or an F. One of my friends went twice, and never went back. Her 1st visit she got a dish that rocked, and would make anyone turn vegan and request this as a daily meal because it was that good! 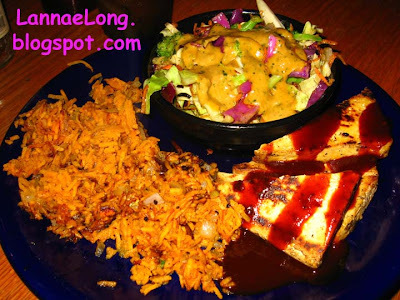 Her 2nd visit a couple days later, ordered that same dish, and it was one of the worst dishes she ever had, and would fuel any vegan nay-sayer to say, "See vegan dishes are gross, how can you eat that!?" So, the 4 of us all heard the same stories from friends who ate at the Wild Cow, and we were wondering if we on an A+ day or and F day. Well, Fridays and Saturdays seem to have the A-team working, so we were there on an A+ day. 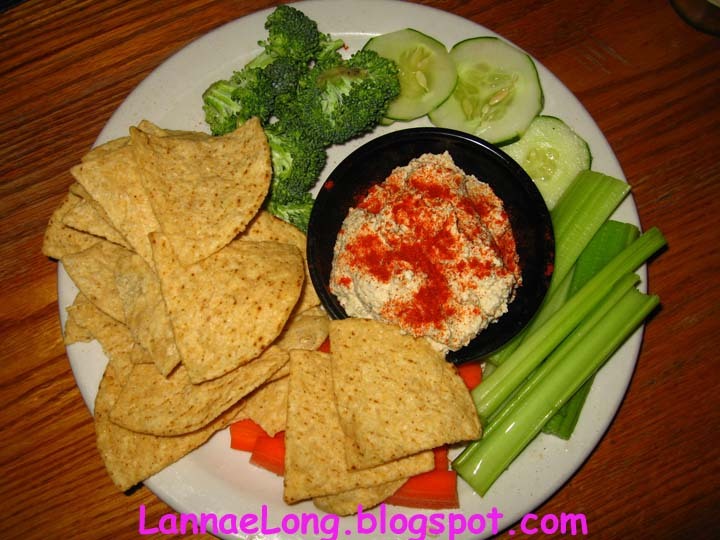 We started off with cashew dip. We loved it! We dove right into it! It was slightly like a hummus, but a cashew nut flavor. It was creamy without cream. Dunno how its made, but wish I did! We loved the fresh veggies served with it. There were corn chips served with it, and the only way to make this appetizer better would be to have how made tortilla chips come with this dish! But, I don't think they have a deep frier, so that would make it difficult to make homemade chips. For our entrees, we got a grilled tofu salad, beans and greens with garlic aioli, quinoa tacos and the homestyle plate. 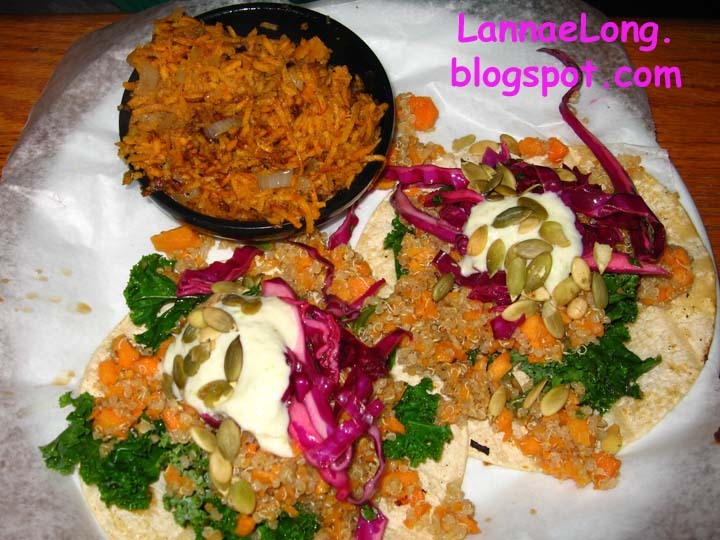 The homestyle plate is a nod to the Nashville meat and three, and is a hearty portion of gluten free vegetarian foods. The sweet potato is a big pile of riced sweet potato with light spice and onions (I think), and I have not seen sweet potato served this way before, but we all agreed this is the stuff we could eat again and again. I must try it again and deconstruct it and attempt to make it at home. Delicious. The quinoa tacos are very big and filling. The sauce and spices are good, and you would never miss that meat in this taco. Actually, I think meat would take away from the goodness of these tacos. I ordered beans and greens from my dish. Beans and greens is at one time, 50 -70 years ago was a staple dinner before the meat lobbies fooled us all into believing we should eat meat at every meal. I make beans and greens more often than other meals because it can be quick (if I use a can of beans) by tossing greens and beans in a pot, heat, ta-da! Dinner! Beans and greens is a comfort food in my house, however I usually make it with some chicken stock or a couple strips of locally made real hickory smoked bacon to give another layer of flavor. The Wild Cow version is vegetarian, so no bacon or chicken! Guess what, I DID NOT miss the bacon or chicken stock. This was a very hearty dish, pinto beans, kale and quinoa with a delicious garlic aioli on top. The beans and greens were seasoned well, and that aioli, no idea how they made it because it is vegan, so no egg at all, was the sauce of the the gods. I could not get enough of the vegan aioli! I just love it! Perhaps it is ground flax seed, perhaps a little arrowroot, I am not sure, but the texture and flavor was divine. We all left feeling good after eating at the Wild Cow. We were full, but not weighed down with trans fats. It felt like the food we just ate was doing our bodies good. Our arteries were much happier with us after this meal. I felt like it was the perfect "detox" after the week of h#llish food. We all want to go back. We all decided that we will go back, but on the weekend during high traffic time when the Wild Cow is more apt to have the A-team cooking and making delicious food.